Last Saturday was a button-shopping trip with a friend. I said it last time and it's still true; digging through the button trunk at Rubans Boutons is like sifting through jewels in a treasure chest. They're now up on St-Hubert in the fabric district, so not such a neighbourhood treat, but it's still just $4 for a medium bag of selected buttons. I got 2 this time, and managed to cram in over 550 buttons. 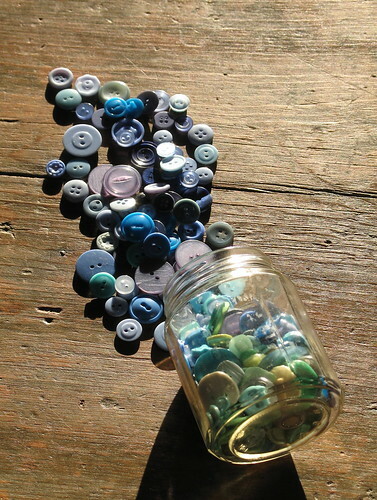 I had a great deal of fun sorting my buttons after I'd washed them. I now have 3 jars full, including some that my Mom gave me from the family button tin. After spending a couple hours digging through buttons, it's easy to forget exactly what you've chosen. I always find it satisfying to sort by colour. Perhaps it's something to do with being a visual person, but I've always like sorting my pencil crayons or selecting new colours of pencil crayons. Is that just me? Certainly for me, the same appears to be true of buttons. There were some nice surprises of ones that matched buttons I'd selected the last time (as well as some I remembered and specifically chose for that reason). 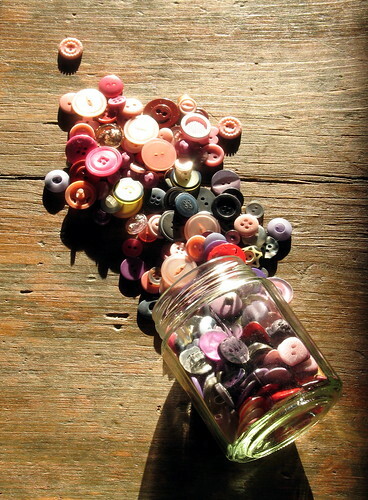 I'm looking forward to dreaming up projects for buttons. Maybe part of mixed media pieces? Or sewn in patterns to make my clothes more quirky? 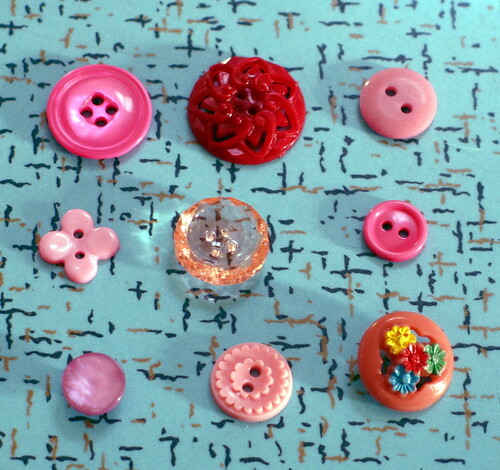 Or used to make button jewellery? Unlike my more disciplined friend, I did not go with much real purpose other than the delight of scooping through pretty buttons. So I just picked and chose where my eye was drawn. I mostly chose within my preferred spectrum of blue, green, and purple, though a bit of red and pink were also included. 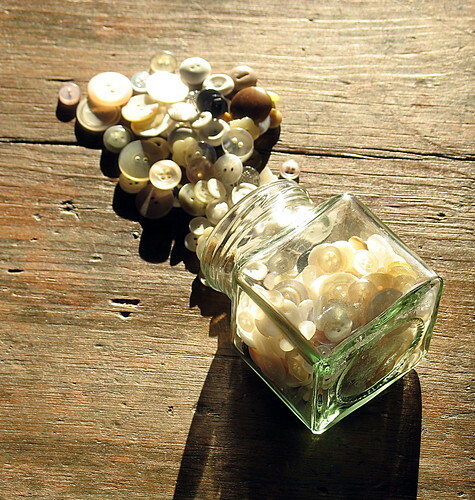 I did have my eye out for a variety of white and cream buttons with a view to a monochromatic project with the variation in texture of different buttons for interest. Oh, the multitude of possibilities is delightful. I'm so glad you posted this, because I had made a mental note to ask you where the button shop was. Now I have their website bookmarked. Your button photos as lovely! Oh, I may have had good intentions but I still came back with way more buttons than I intended. I love your buttons. I wish I had found some of the beauties you did! I just did a posting on some button magnets I made and it was such fun looking for unique ones. Thanks for sharing your pictures.